In the 21st century, the realization that asteroids and comets have struck, and continue to strike, planetary bodies throughout geological time has revolutionized our understanding of solar system history and evolution. It is now widely recognized that impact cratering is one of the most important and fundamental geological process in the solar system (Osinski and Pierazzo 2012). Indeed, impact craters are one of the most common geological landforms on most of the rocky terrestrial planets, asteroids, and many of the rocky and icy moons of the inner and outer solar system. Once thought to be purely a planetary science “problem,” it is also now apparent that impact events have profoundly affected the origin and evolution of Earth, its environment, and the habitability of our planet (Grieve 2017). Furthermore, the fireball event of 15 February 2013 in Chelyabinsk (Russia) (Brown et al. 2013) served as a wakeup call that impact events are not a thing of the past and could still, in practice, occur at any time. Which brings us to the Impact Earth initiative. This is a large-scale, global project set up by the Centre for Planetary Science and Exploration at the University of Western Ontario (Canada) that has the twin goals of increasing public awareness and interest in, and of encouraging the teaching and research on, meteorite impacts and the closely related themes of meteors and fireballs themselves, meteorite falls, and crater-forming events. The fact that Impact Earth is hosted at the University of Western Ontario (Canada) is a significant advantage because researchers there are studying all aspects of meteorite impacts. Figure 1. 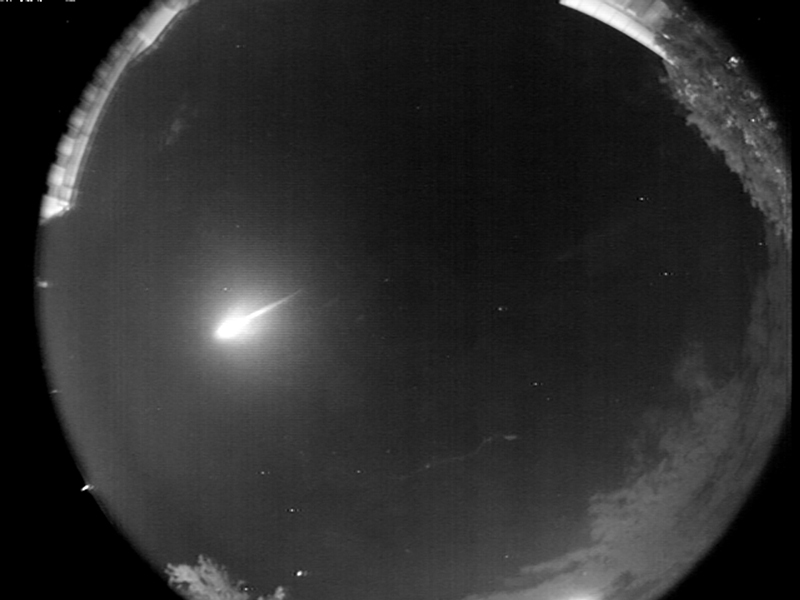 All-sky camera image taken at 9:03 PM on 25 September 2009 by the University of Western Ontario’s Southern Ontario All-Sky Meteor Camera Network (SOMN). This camera recorded a fireball in the evening sky over the western end of Lake Ontario (Canada). Subsequent recovery efforts led to the discovery of the Grimsby meteorite (Brown et al. 2011). The Impact Earth database can trace its origins back over 50 years. In Canada, the systematic search for impact structures was initiated in 1955 by Dr. Carlyle S. Beals, who was the who was the Dominion Astronomer of Canada at the Dominion Observatory (Ottawa, Canada) at the time. Searches initially involved the examination of over 200,000 aerial photographs of the Canadian Shield. The first published worldwide listing of impact structures on Earth was by Dr. Michael R. Dence (Dence 1972), who listed 50 confirmed structures and an equal number of “possible” structures. Over time, additional structures were added, as were other data on their nature and characteristics, and a searchable digital database was created and maintained initially at the Earth Physics Branch of Canada’s Department of Energy and, later, at the Geological Survey of Canada in Ottawa. The current listing is an outgrowth of these earlier efforts but is a full relational-database, with enhanced available attributes and search capabilities. Over the coming months and years, further attributes such as shock metamorphic effects and geophysical attributes will be added to the current database and released publicly. In doing so, it is hoped that the Impact Earth database will provide an important new tool for researchers interested in meteorite impact craters and their effects. At the core of the Impact Earth initiative is the website www.impactearth.com. It features background information on the threat of meteorite impacts on Earth, the detection of meteors and fireballs, an introduction to meteorites, and an overview of the formation and recognition of meteorite impact craters. A listing of the University of Western Ontario’s growing meteorite collection is also provided, as is a fireball camera integrated with the Southern Ontario All-Sky Meteor Camera Network (Fig. 1) (Weryk et al. 2008). A central feature of the website is a new searchable database of all confirmed impact craters on Earth and many of their most salient attributes, such as age, size, year of discovery, and so on. At present, the web site contains data on 195 structures. Only craters with confirmed evidence for shock metamorphism (French and Koeberl 2010) are listed (see also the October 2017 CosmoELEMENTS article by Ludovic Ferriere). Figure 2. The product of the Impact Cratering Activity available through the Impact Earth website. Impact into flour and cocoa powder. Figure 3. 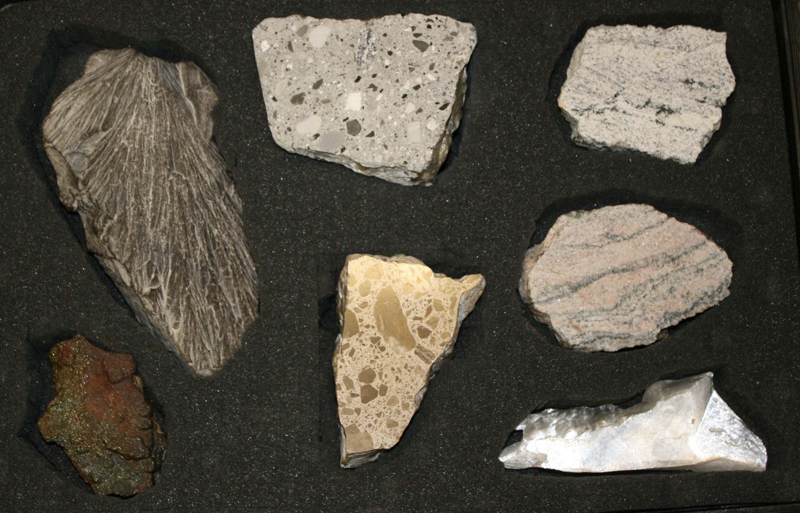 An example rock kit comprising seven samples from the Haughton impact structure (Canada). The kits are provided in pelican cases to protect the samples during transport and in classrooms. In order to increase not just public awareness but also to facilitate the teaching of meteoritics and meteorite impacts in elementary/primary schools through to universities, a series of resources are available to the community through the Impact Earth website. 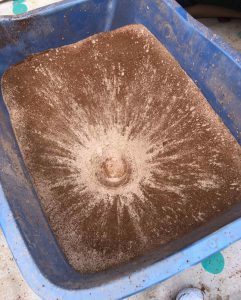 The Impact Cratering Activity is designed to follow an inquiry-based learning approach where students develop their own experiment while working through the steps of the scientific method. The aim of this activity is for the students to gain an understanding of the basic characteristics of impact craters and how they form throughout the solar system. This activity can be modified for students in Grades 6 to 12, and the best part is that they get to create their own craters – and make a mess (!) – in layered mixtures of flour and cocoa powder (Fig. 2). A unique aspect of this activity is the availability of rock kits that can be requested for loan through a simple online form. The foundation rock kits contain a variety of rocks from several impact craters around the world (Fig. 3), and worksheets are available for teachers to guide them, and their students, through the use of the kits. Other activities have also been developed and are available on the Impact Earth website. For example, Mission Meteorite is an interactive station-based activity designed to help students understand the different types of meteorites using scientific inquiry methods and questioning. A major inhibitor to teaching students about meteorite impacts at the undergraduate and graduate level is the scarcity of materials. There is not an Earth science department around that doesn’t have hand samples of igneous, sedimentary, and metamorphic rocks, but very few have the products of a meteorite impact. As such, the Impact Earth rock kits are also available for loan to university instructors. For these more advanced levels, a selection of petrographic thin sections is also available, as are more specialized rock kits featuring the products of individual craters. At present, kits are available for the Gow Lake, Haughton, Mistastin Lake, Sudbury and West Clearwater Lake impact structures in Canada, and the Ries and Rochechouart impact structures in Germany and France, respectively. As we enter a new age of exploration of the solar system – including the return to the Moon where impact craters are the dominant geological landform – it is hoped that the Impact Earth initiative will provide a valuable resource for researchers and the public alike and stimulate interest in the study of fireballs, meteorites, and impact craters. Here on Earth, there are still many impact craters awaiting detection, and we look forward to featuring these new discoveries in the Impact Earth database! Check out the website www.impactearth.com and follow Impact Earth on Twitter @impact_craters. Impact Earth was funded by grants from the Natural Sciences and Engineering Research Council of Canada’s PromoScience program and the Canadian Geological Foundation, together with support from the Department of Earth Sciences and the Faculty of Science at the University of Western Ontario.